Need to stock up on kimchi? Sweet rice porridge? 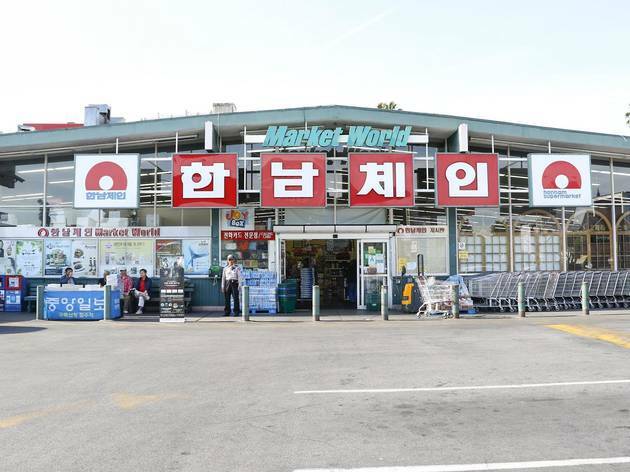 Stop by a Korean market on your next K-town visit for your Korean food fix. 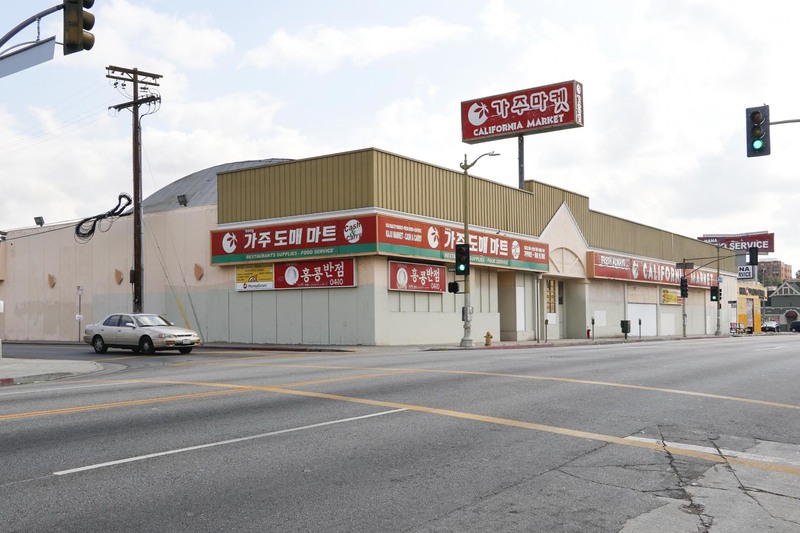 There's a lot to see and do in Koreatown—chow down on Korean BBQ, belt your heart out at a karaoke bar—but a pass through without stopping by one of the Korean markets would be a miss. 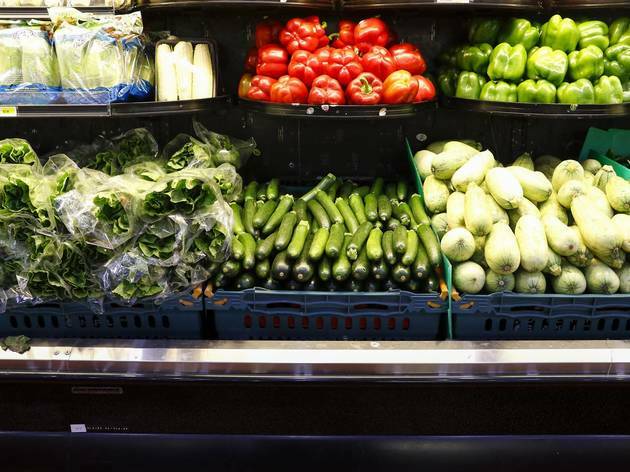 These markets aren't just a place to stock up on fruits and veggies, but offer as much bulgolgi and steamed rice cakes as any Korean restaurant. 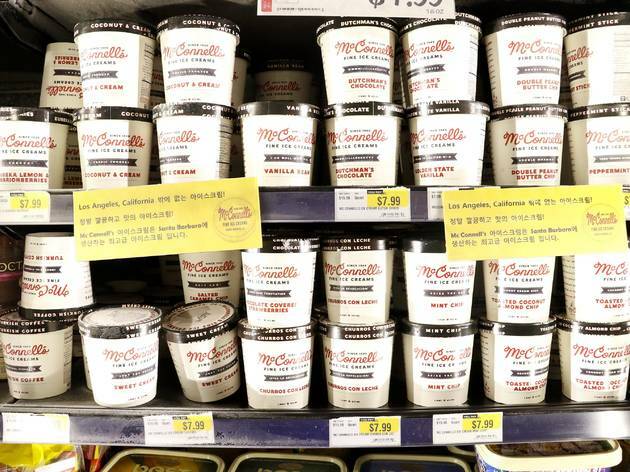 Here are the best Korean market options in K-town to experience the Land of Morning Calm—without ever getting on a plane. 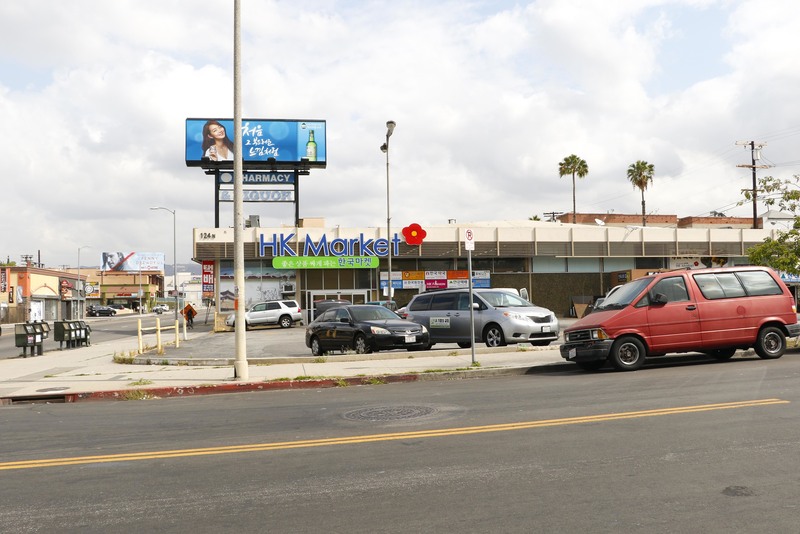 California Market serves both its nearby Latino and Korean population on the Koreatown-Hollywood border. At this stand-alone market, you’ll find your most common Korean produce like daikon or green onion, but you’ll also notice stacks of cilantro, avocados and papayas, too. The best part of getting your groceries here is the tiny juice stand nestled near the entrance. 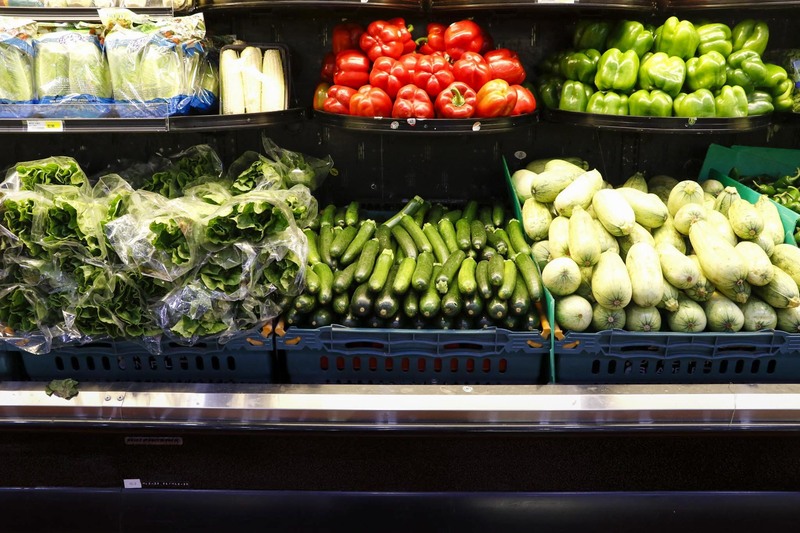 They press everything from your run-of-the-mill orange juice to your fancy kale/spinach/ginger green juice to guzzle while getting your weekly grocery shopping done. And if you’re still hungry, you can reverse all the beneficial effects of that juice at the attached jjambong shop: Spicy seafood noodle soup with so much MSG that you’d be hard pressed not to fall asleep at the counter. But you had the green juice so it doesn’t count, right? Behind the row of cashiers at Hankook Supermarket (or HK Market) is a tiny heat lamp-lit shelf stocked with comfort food made fresh every morning: pumpkin and sweet rice porridge, blood sausage, and spicy rice cakes ready to grab and go. It’s the ideal stopover for when you’ve worked late and want something satisfying to eat while catching up on your Netflix queue. Along with those ready-to-eat snacks are packaged single servings of rice, soup and fried fish that make for a hearty and authentic Korean meal. 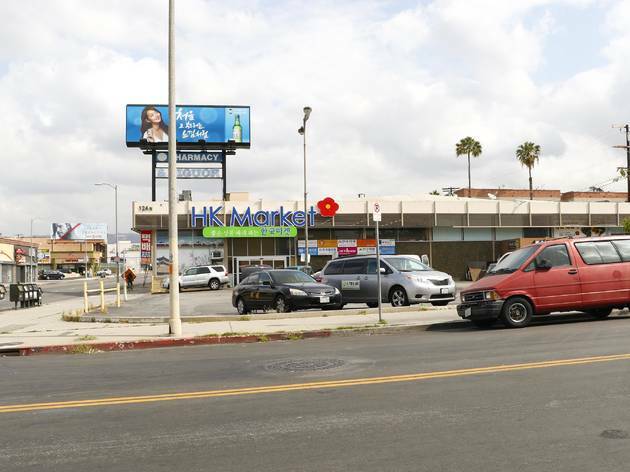 The large box-shaped store takes up a decent-sized lot on Western and 1st, and the ample open parking lot is a bonus. As you leave, make sure to stop at the equally tiny counter bakery in front of the sliding exit doors that boasts one of the best croquettes in town. Just open the case and grab the curry-flavored one, and you’ve got a deliciously decadent snack to tide you over on your drive home. Though some of Koreatown’s supermarkets boast live seafood, Hannam Chain is one of the few that has tanks keeping crustacean delicacies like crab and lobster at their peak (read: alive) until you’re ready to smother them with melted butter. The seafood section along the back wall is where you can make eye contact with your dinner and treat yourself to a fancy meal for under $20. The Pico-Union Hannam Chain location also has an extensive collection of freshly steamed rice cakes that are usually eaten on holidays and special occasions. Lucky for us, we can get the sticky, gluten-free sweets on even our most mundane weeknights—no Lunar New Year necessary. Hannam Chain has it’s own fenced in lot with free parking. 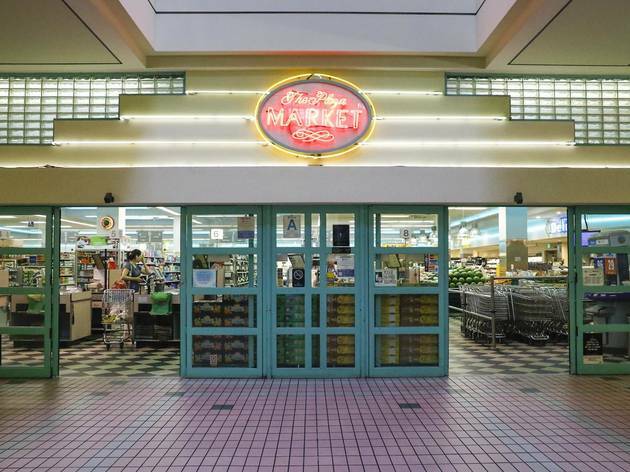 Madang Mall, one of Koreatown’s largest shopping centers, now boasts an underground supermart amongst movie theaters, bakeries and eateries. 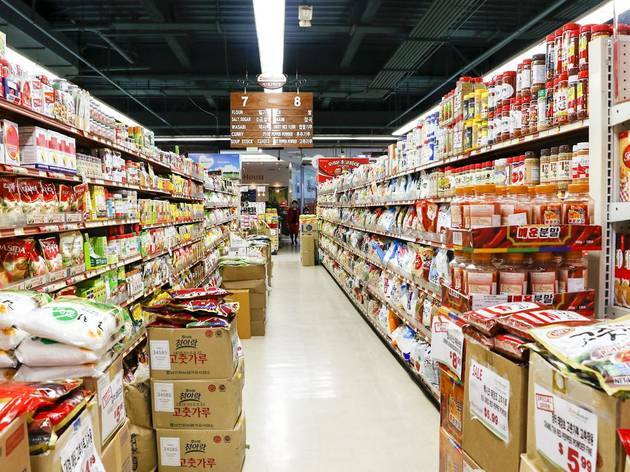 H Mart, located at the basement level of the plaza, is unique in its stock, where you can buy both specialty American items and traditional Korean fare. 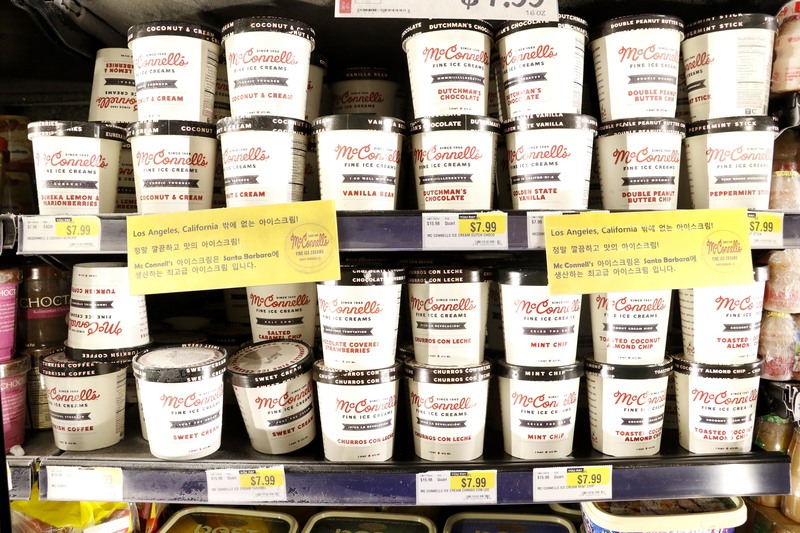 Think: McConnell's ice cream, Yogi Teas and Bob’s Red Mill Quinoa alongside dozens of types of kimchi, octopus banchan and tofu. As one of the newest (and fanciest) markets in town, the produce here is more expensive than some of the legacy grocery stores, but you pay for the convenience of picking up dried cuttlefish and gelato all in one place. Go on busy weekends for samples handed out by wonderfully vocal Korean women. If the samples aren’t enough to fill you, head catty-corner from the entrance where you’ll find a tiny window for ordering simple sushi rolls and Japanese udon noodles. Venture a bit past that and an H Mart employee with a makeshift table sells skewers of fishcake bubbling in a rich daikon broth. Parking is stressful on the weekends, but you get validated for the parking structure accessable via Western Ave or Manhattan Place. Note: They don't sell beer or hard alcohol here. 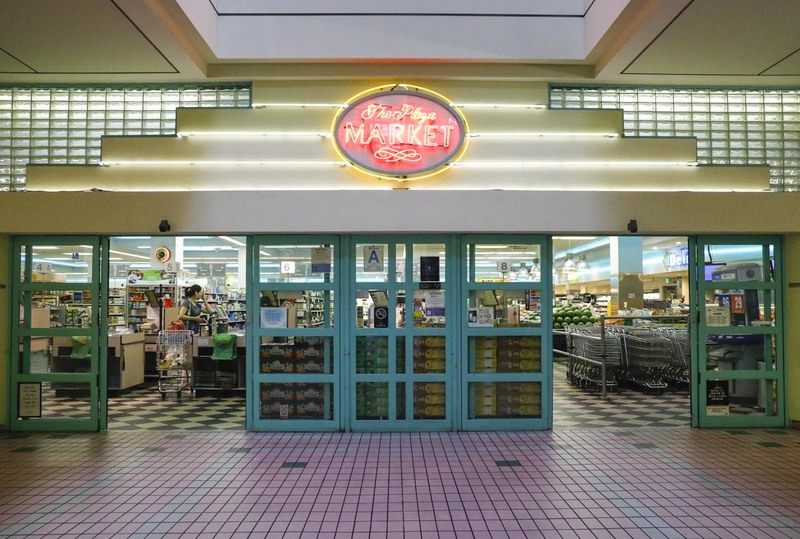 One of the largest markets in Koreatown—with a French-style bakery, rice cake shop and pharmacy all contained within its walls—consumes the entire bottom floor of the Koreatown Galleria mall. The draw here is not only the sheer sprawl of the place (and hence, a massive selection of produce and dried goods imported straight from the motherland), but the self-serve options. Grab one of the plastic containers that sit flush beneath the huge banchan buffet bar in the back and use the tongs to stock up on pickled spicy cucumber, homemade kimchi, acorn jelly or marinated perilla leaves. The cashier will weigh your banchan for you when you check out. Another self-serve option is a rolling rack of galbi and spicy pork marinating in large metal trays primed for your next grill-centric gathering. Parking is free in the structure. The eastside version of Western Avenue’s Galleria Market is a smaller iteration of its older, more established sister, but what Galleria on Vermont lacks in age and size, it makes up in convenience. 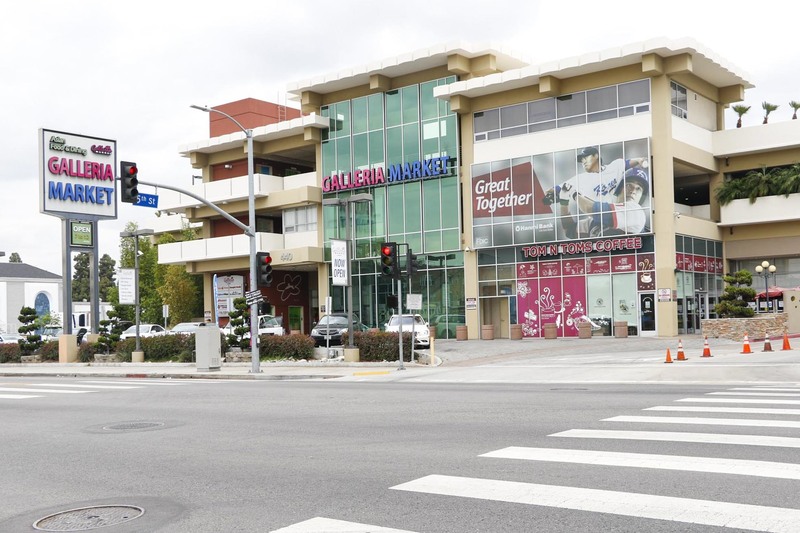 Those who are coming to this Galleria are here for one reason: To buy groceries, so parking is never a fight and the crowds are relatively sparse compared to the original’s location. 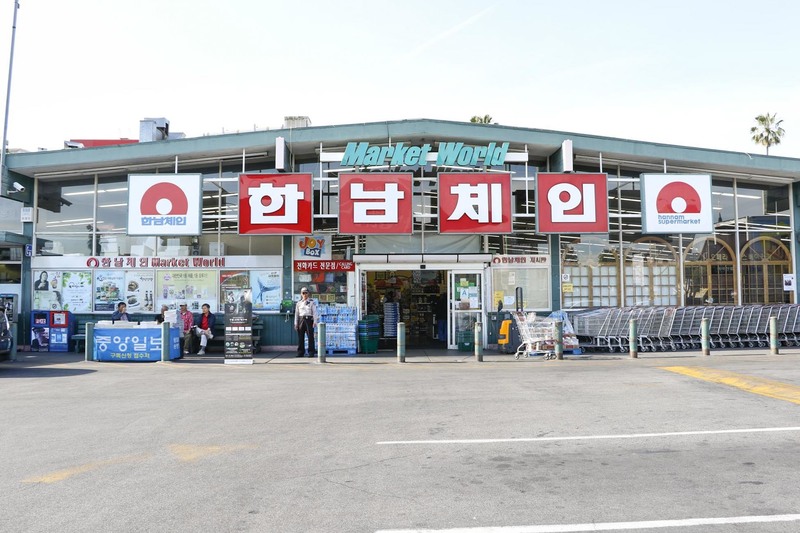 Though the market carries much of the same stock as other grocery stores in Koreatown, there are specialties that will make your next weeknight dinner a breeze: namely, the pre-sliced, packaged sashimi dinners complete with a gochujang and vinegar dipping sauce or crab stew kits (just throw the pre-packaged vegetables, crab and seasoning into a pot and let simmer). There are also tiny restaurant-fronts that serve food through windows, so you can sidle up to a bar and nosh on fast food favorites like fried dumplings or gimbap. 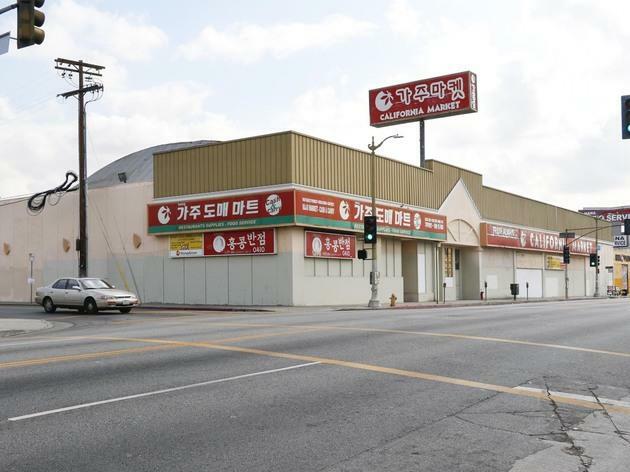 A compact market on the bottom-most level of Koreatown Plaza, this shop was one of the first markets to crop up in the area in the ‘80s. You’ll find typical fare here, but beeline for the popular liquor aisle where you can get your fill of crisp Korean beers like Hite and Cass, potent green glass bottles of soju, and an unfiltered, milk-colored rice wine called makkoli. 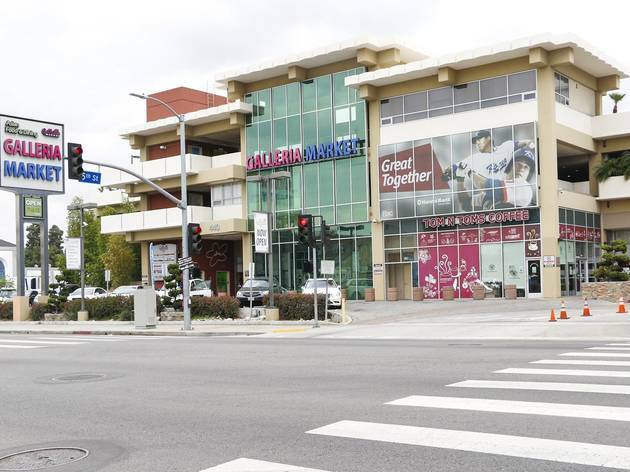 Though Koreatown Plaza may seem outdated (it got its last update nearly three decades ago), the stores in this mall are still where savvy young Korean Americans come to get their fill of designer goods like "Chanel" accessories. Bonus: They have one of the most authentic “street food” food courts around, where you can post up under harsh fluorescent lights and buy a pork cutlet bigger than the size of your head for under $10. Parking is validated, but don’t forget—they won’t let you out without it. 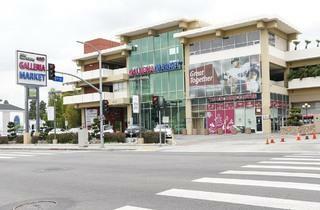 Think of this market, located on the ground floor of Koreatown’s City Center, as a city market. 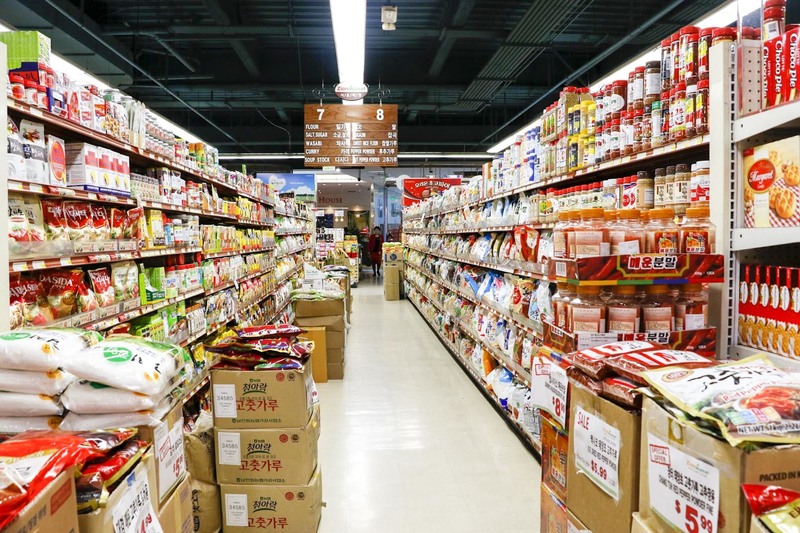 The aisles are more compact, there’s less room to meander, but it’s an efficient way to stock up on essentials once you’ve finished perusing the cosmetics, clothing stores and shoe stores located on the second and third floor of this mall. The best time to come is in the afternoon, when you’ll head straight for the bunggoppang (carp bread) stand located on the 6th street side of the market. Vendors in white aprons hawk these fish-shaped desserts filled with custard or red bean—made popular in Korea during the Japanese occupation—with astonishing speed. Next to the bunggoppang vendor, there’s a table piled high with pre-made, quick-to-eat proteins like fried chicken drums glazed in a sweet and spicy sauce, garbanzo bean fritters that just need a quick fry to re-heat, and hunks of pollock that have been covered in egg and pan-fried. Parking is on the Mariposa Avenue side of the market and easy to miss, so drive slowly to turn into the small driveway that leads underground. You will be validated for two hours, but it gets crowded on the weekends so opt for off-hours like weeknights.